The Global Volcanism Program has no activity reports for Puyuhuapi. The Global Volcanism Program has no Weekly Reports available for Puyuhuapi. The Global Volcanism Program has no Bulletin Reports available for Puyuhuapi. A chain of dominantly basaltic cinder cones erupted along two NE-SW-trending fissures at the head of Puyuhuapi fjord comprise the Volcanes de Puyuhuapi. The larger group of four cones lies on the W side of the fjord and fed lava flows that traveled SE to the sea. The second lineament formed a chain of four smaller cones between the head of the fjord and Lake Risopatrón to the N. The two fractures are related to the regional Liquiñe-Ofqui fault zone. The cinder cones are extremely well preserved, suggesting a very young age. The Global Volcanism Program is not aware of any Holocene eruptions from Puyuhuapi. If this volcano has had large eruptions (VEI >= 4) prior to 10,000 years ago, information might be found on the Puyuhuapi page in the LaMEVE (Large Magnitude Explosive Volcanic Eruptions) database, a part of the Volcano Global Risk Identification and Analysis Project (VOGRIPA). There is no Deformation History data available for Puyuhuapi. There is no Emissions History data available for Puyuhuapi. 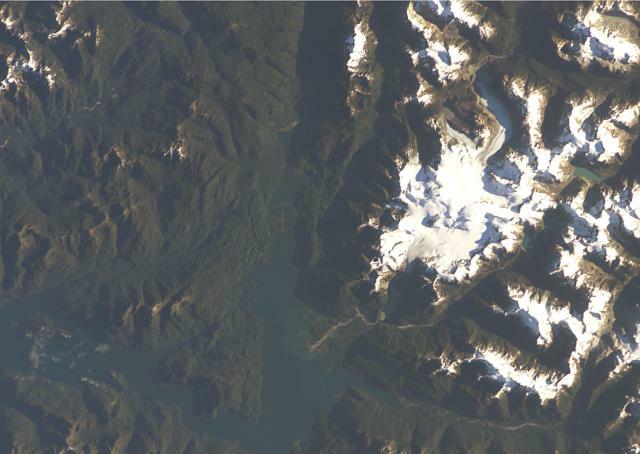 A chain of cinder cones was erupted along NE-SW-trending fissures at the head of Puyuhuapi fjord (top-center) in this NASA International Space Station image (with north to the upper left). The Volcanes de Puyuhuapi consists of a larger group of four cones on the western side of Puyuhuapi fjord and a chain of smaller cones north of the head of the fjord. The two fractures and the fjord are related to the regional Liquiñe-Ofqui fault zone. The town of Puyuhuapi lies on the western side of the fjord, about halfway down its visible length in this image. NASA Space Station image ISS004-E-7079, 2002 (http://eol.jsc.nasa.gov/). There are no samples for Puyuhuapi in the Smithsonian's NMNH Department of Mineral Sciences Rock and Ore collection. Large Eruptions of Puyuhuapi Information about large Quaternary eruptions (VEI >= 4) is cataloged in the Large Magnitude Explosive Volcanic Eruptions (LaMEVE) database of the Volcano Global Risk Identification and Analysis Project (VOGRIPA).